If we wish to see our STEM (science, technology, engineering, and mathematics) broadening participation efforts affect change, we must also critically reflect upon and broaden our scientific approaches to studying STEM participation, adopting methodologies and frameworks that most appropriately fit the problems and questions at hand. 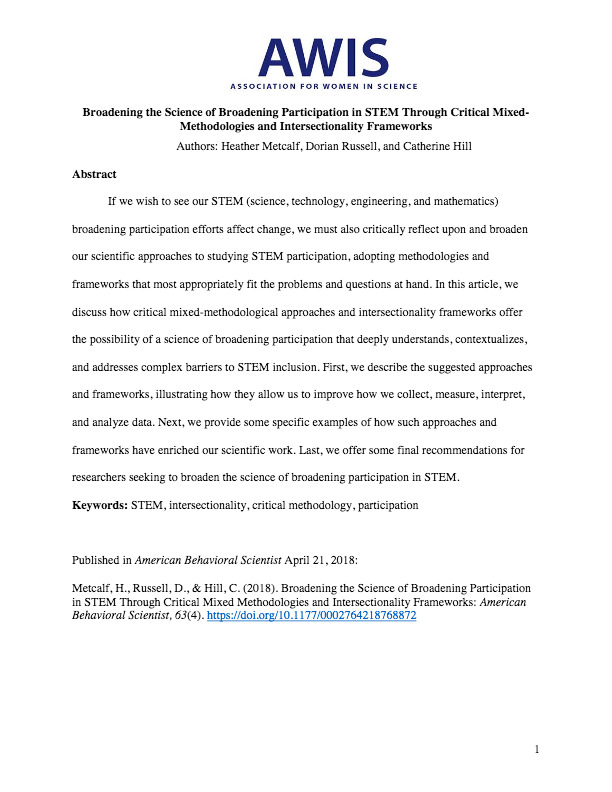 In this article, we discuss how critical mixed-methodological approaches and intersectionality frameworks offer the possibility of a science of broadening participation that deeply understands, contextualizes, and addresses complex barriers to STEM inclusion. First, we describe the suggested approaches and frameworks, illustrating how they allow us to improve how we collect, measure, interpret, and analyze data. Next, we provide some specific examples of how such approaches and frameworks have enriched our scientific work. Last, we offer some final recommendations for researchers seeking to broaden the science of broadening participation in STEM.